Anthem-kneeling protests will likely get much worse during the upcoming NFL season. The league is enforcing a new policy that will fine players for kneeling during the national anthem unless they choose to stay in the locker room. But one outspoken NBA star’s father just shut down all of those anti-American players with two words. The former UCLA star point guard, Lonzo Ball, was the Los Angeles Lakers 2nd pick in the 2017 draft. He largely had an up-and-down rookie season where he showed flashes of brilliance, however there is a lot to his game that he needs to work on. Ironically, it’s his father that makes national news more than him. 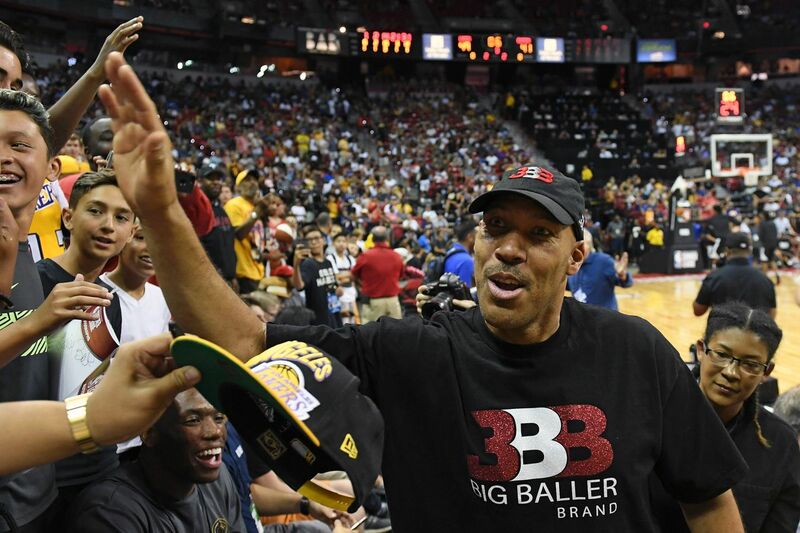 LaVar Ball is one of the most eccentric personalities to storm onto the sports stratosphere in quite a long time with his absolutely insane comments. Ball averaged a measly 2.2 points each game in college and never made it to the NBA. Meanwhile Jordan has won six championships. The helicopter parent and creator of“Big Baller Brand” clothing and shoe company isclearly using his son’s success to brand himself. But surprisingly, he made an outstanding point when he was asked about the anthem-kneeling NFL players. Ball frankly pointed out that these players who have a problem with the NFL’s new policy – fining players who decide to kneel – should “get out” of the league. Unfortunately for the “know-it-all” who perceives himself as a Steve Jobs-type, his new league is failing miserably. You might remember that President Trump saved one of Ball’s younger sons, LiAngelo Ball –who was one of three UCLA students caught stealing at a mall in China where they were immediately detained on serious charges. LaVar refused to acknowledge Trump’s generous act. Ball claims he did send the President a cheeky gift however. Ever the promoter, LaVar Ball told “Today” on Tuesday that while he refuses to thank Trump, he did mail a few pairs of Big Baller Brand sneakers to the White House. “I sent him three pair — red, white, and blue — to show him we patriotic,” Ball said. This gesture sounds ingenious, but maybe siding with Trump on the anthem-kneeling issue is his way of saying he truly is grateful for what President Trump did for his son.